A quick blast of precipitation is in store for the northern Utah mountains overnight tonight acting as a bonus on top of the impressive accumulations from the past week or so. While the Salt Lake Valley has had flurries off and on this afternoon, higher elevations have already seen a dusting of an inch or two thus far. A plume of moisture with a more northerly track than our previous storms is progressing southward into Utah this evening, and a weak shortwaves will allow for some ascent and precipitation as the moisture quickly moves across the area. Storm Prediction Center Mesoanalysis of 700 mb temperature, moisture, and winds at 02Z (7pm MST). Northwest winds are advecting moisture into northern Utah. Green shading indicates areas of 700mb relative humidity greater than or equal to 70%. Click picture for current version. This evening’s sounding from the Salt Lake International Airport at 00Z (5 pm MST) shows a thin layer of saturated air between about 600 – 700 mb, or just above mountain crest height for most of the Wasatch. Additionally, highlighted in blue on the sounding are temperatures between about -12 C to -18 C, known as this dendritic growth zone, right about where the layer of saturated air is located. This temperature range is generally best for growth of snowflakes into stellar, six-sided crystals that imagine when you think of a “perfect snowflake”. Additionally, this is what generally produces extremely light, fluffy powder. Unfortunately, moderate winds in the mountains will mean that transport of these delicate crystals will readily occur. Atmospheric sounding from Salt Lake International Airport this evening. 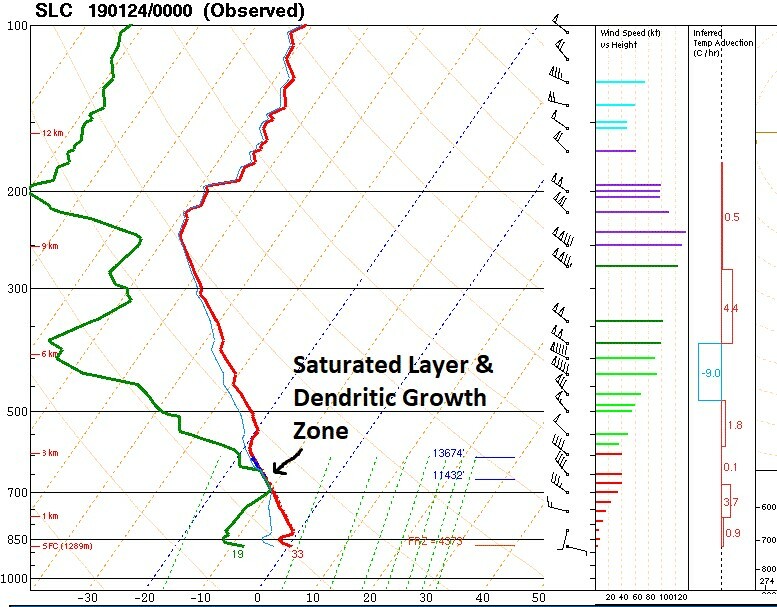 A saturated layer is evident, and is about at the same temperature range of the dendritic growth zone. Click to go to the SPC soundings website. After tonight, several days of calmer weather are expected. Snow showers are possible Friday evening, but at this time nothing much in terms of accumulation should come out from them. Our next chance for any stronger storm system looks to be on Monday/Tuesday- with potential for some frigid air along with it.